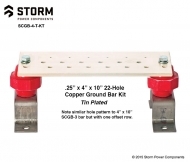 ¼” x 4" x 12" tin plated copper ground bar kit with 18 off ⁷⁄₁₆” holes, spaced at 2” and 1¼”. Includes cover kit. 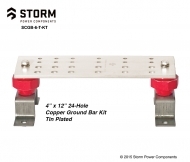 The bar provides an easy way of connecting multiple ground points, quickly and easily. 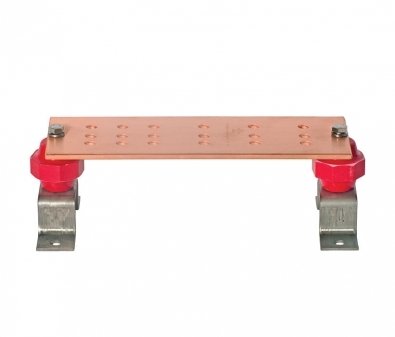 The 18 off ⁷⁄₁₆” pre-drilled holes mean this bar is ideal to meet the grounding requirements of the NEC. The grounding bar represents a very visual part of a client’s installation, it is rarely hidden from view. By using high quality equipment such as this you are showing both them and their inspectors that the work you have done is to a high standard and compliant with both NEC and state codes.